And this is Sue. They both have two 1/2 gallon tanks with fake and live plants. They are sitting where they can see each other if they are both in the right spots in their tanks. What are these freshwater bugs? UPDATE: My brother, Karl Koenig found some info, and I looked too. Someone even answered on youtube, and we all agree, they are leaches! During my research, I was surprised to read that they are still being sold for medicinal purposes. I put them back with the worms in their aquarium so if they wanna make more, I’m sure the fish will love them as much as the brown worms. I thought at first they were snail poo, as when they are threatened, they roll into a round ball. Sorry about the music, I thought i listened and clicked cancel, but don’t care enough to upload again. [using the ‘free’ music on youtube’s site, also gives them permission to show ads on your video, but the ‘x’ works to close the ad. Some women want diamonds . . . I am perfectly happy with worms. I can be entertained for hours or days, even weeks with a plastic tub of worms. I brought home more today. The worms I brought home Dec 12 were doing great, and still are. But I was feeding them very sparingly to the fish since i didn’t want their numbers to deplete before I had a good ‘regenerating’ worm pile. I had actually just finished cleaning the worm houses I have them in now, when Linda @ Crazy Critters called to tell me that they had more in. This is a picture of the worms after i I put them in their new home. I kept them separate from the others. They are still in the ball, mostly, but are slowly spreading out and digging into the sand. They seem to like the sand better than gravel, and they like a layer of java moss too. As i write this now, they are spread out and easy to see in the white sand. I am finding there is a lot of confusion about species online about these worms. It’s the brown worms that have problems with bacteria, but also, the black worms, that they say are ‘safe’ are actually dark brown. For the sake of my sanity i am not calling these black worms, instead of Tubifex, even though some say they are similar. The scientific articles that i tried to find today, no longer exist. But i will keep trying to identify these critters. And I still believe whole heartedly, that the conditions under which people are keeping these worms, that i read about online, is what leads to the harmful bacteria growth that people blame the tubifex worms for. Before you cry to me about how dangerous the worms are and you think what i say is misleading, know that I have no scientific evidence or even citations to back my opinion up, and that’s all it is, my opinion. If you keep worms in the refrigerator, and don’t feed them for a week, they are going to die, and I’m sure bacteria will grow. Food kept in refrigerator too long grows all kinds of things, and is no longer edible. Poor worms. I believe you have to duplicate as close as possible to the conditions where these worms [and other critters] are found thriving on their own in the wild. I do water changes for them everyday, just like i do my bettas who live in the 2 gallon uncycled tanks. 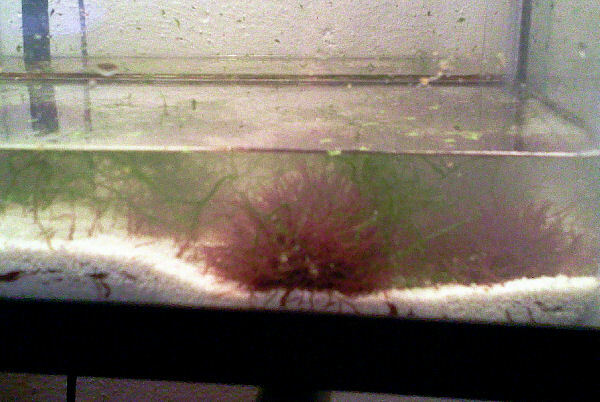 After rinsing the sludge that comes from the big, filtered 10-50 gal aquariums, I give the worms that too. I don’t give them the water that comes out with it. I won’t mention what’s in that, as I’m sure you can guess, but hey, they’re worms, they like it. Its as close to i have to what might be at the bottom of a lake. The first batch are thriving, and I’m sure even with feeding some to the fishes, I still have as many as i started with from the first cup and more. I am so ready to find some little freshwater pufferfish! All that’s left now is to wait for warmer weather for them to be shipped in. In the mean time, the fish i have now, mostly bettas, are loving these worms. The young bettas in a 6 gal tank, ‘hunt’ the bottom of their tank for them several times a day, since they are used to grabbing them while the worms are digging down into the sand. 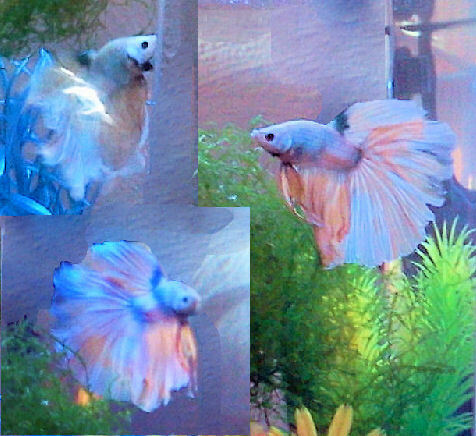 Two of my oldest betta males haven’t really figured out what to do with them, big tough fighting fish are scared of tiny worms, lol. This boy’s tail gets longer and longer. 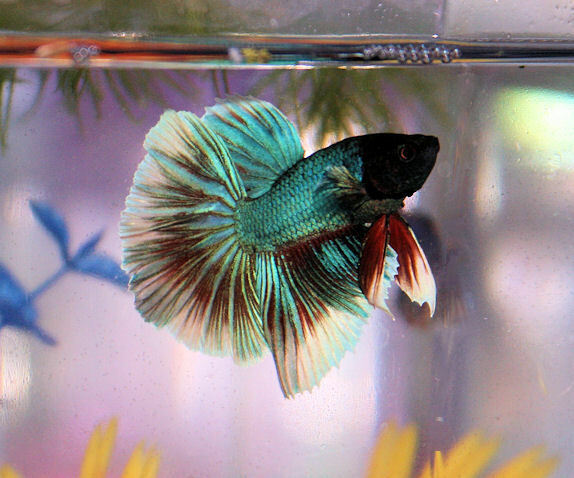 He likes to rest with his tail flared out over java moss, the heater or anything else in his home. 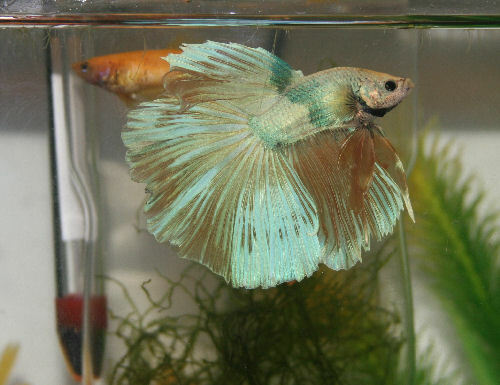 I hope to catch him when he’s fully flared, for he is about as spectacular as a betta can get. 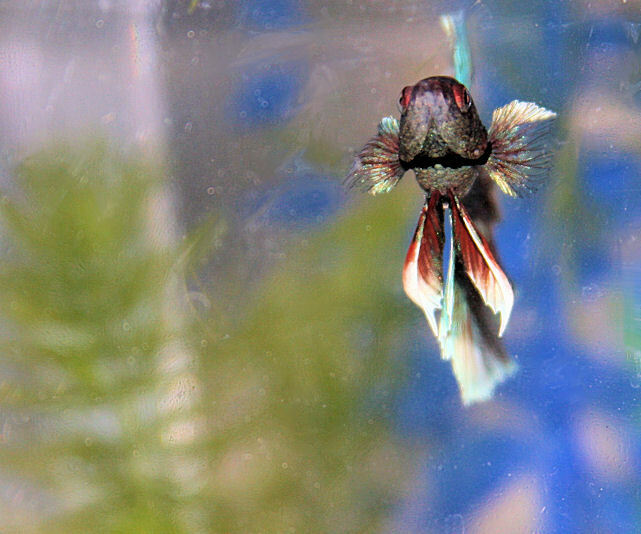 He is the shiest, most sensitive betta boy i have. He will flare and dance when i take the dividers down between the tanks so he can see his neighbor, but he doesn’t do it with the vigor of the others and frequently dives to the bottom of his tank to hide. While his neighbor, [right now its Mocha] looks like he is trying to chew through the glass to get to Banana, Banana is staying near the middle of the tank putting on his display. Mocha and Sid’s tails got chewed up the last time i tried to breed them. But when banana was with his girl, she didn’t chew his tail [much]. 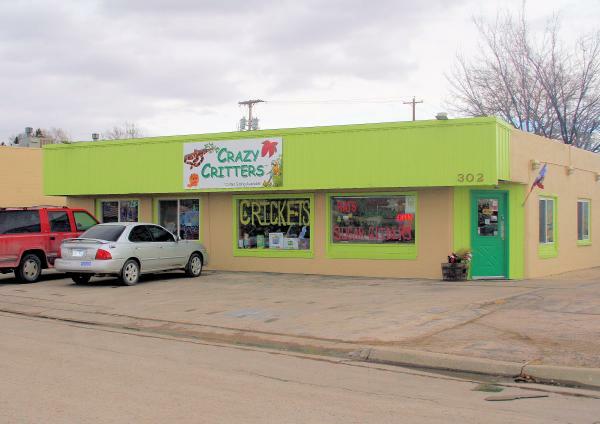 Is a wonderful new pet store in Rapid City. I got Darkmoon17’s betta drawing tattooed on my foot today! Just look at the beautiful Tattoo, pls ignore the chubby old feet 😀 I didn’t plan on getting it colored, but tattoo artist, James Ann, owner of Gypsy Rose, in Rapid City, SD mentioned color and it is gorgeous. 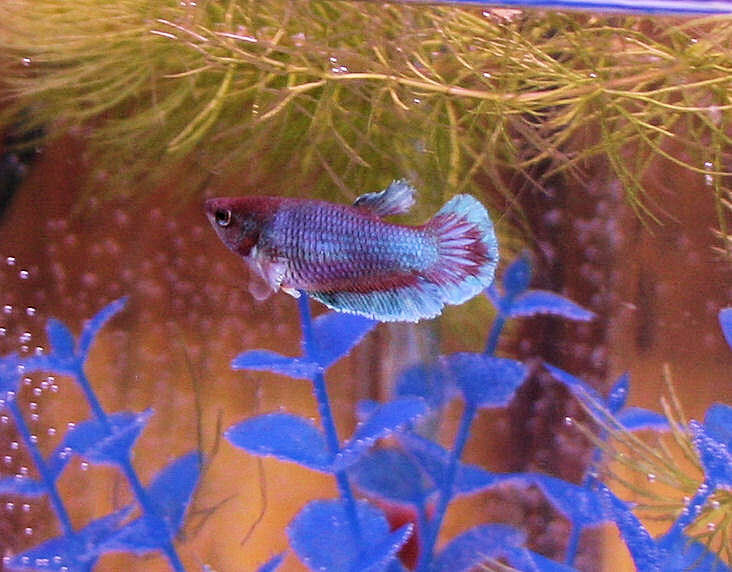 Now if I can just get my real bettas to spawn and make babies like the one forever on my foot, lolz. I took the black outline pic when i thought we were finished. Then she started with the color and the fishy almost came to life! 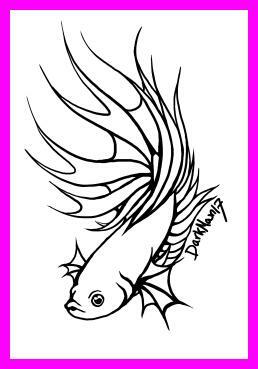 Darkmoon17 has created for me a betta fish tattoo! Yes, I love fish so much I want one on me, with the spider, scorpion and other things important. I have an appointment to have it forever stained into my skin tomorrow! if you need Betta-related art done, she is the one to do it. She also does beautiful horses and other art pieces. Check out her galleries!